Without inviting the obvious 'dont do it' answer, can anyone offer some general safety advice about the dangers from snakes spiders etc when caching in Australia. We are down there for a month in April and intend to do loads of drive bys and walkarounds. So many time we see the beware of snake warnings and just wondered what the locals do to stay fit and healthy. All advice gratefully received. Valliant Knight. Just checked where you're from, ValliantKnight, so perhaps as a fellow Pom, who has travelled widely in Australia, including expedition in far north Queensland rainforest (5 weeks camping in December / January, tracking yellow bellied gliders at night and trapping brush tailed bettongs), more bush walking in QLD rainforest on mainland and islands in Jan / Feb, Overland Trail in Tasmania in March, hiking in Snowy Mountains of NSW around Thredbo in April (as snow arrived) on one trip; 3 months as field assistant to PhD student researching flood history of Fitzroy River, northern WA July to Sept on another trip, perhaps I can give some appropriate guidance. First trip was pre GPS, but 2nd trip we used GPS to record locations, although this was pre 2000 and thus pre geocaching. The key to avoiding snake bites is not to upset snakes ie look where you put your feet, make lots of noise / vibrations to give them a chance to get out of your way. Many snake bites don't actually involve envenomation ie the snake doesn't inject venom through its fangs. In Tasmania, poisonous snakes have grooved teeth, so venom is not injected through hypodermic needle-like fangs, but drips down grooves, so consider wearing gaiters and / or socks, as if they bite, most of the venom would be absorbed by fabric. While most snakes are not usually aggressive, Tiger snakes in Tasmania, defending their young in autumn (ie April) and a few tropical snakes are exceptions and can be aggressive ###s. Having said all that, make sure you (and all in your group) know how to treat snake bite and carry the right kit ie compression immobilsation technique, using rolled compression / crepe bandages. see http://www.health.qld.gov.au/poisonsinformationcentre/bites_stings/bs_pressure.asp which covers technique and when to use it ie which species / groups of animals. As well as looking where you put your feet, look where you put your hands ie don't put hands into holes unless you can see completely clearly - carry and use a stick and torch. Take notices seriously - saltwater crocodiles, for example, are to be avoided and respected. Also, for your own comfort, but also to protect ecosystems, get to know local noxious plants - noogoora burr, for example, in northern WA is unpleastant to humans, but devastating to livestock, having already meant the end of sheep in Fitzroy river area, so avoid spreading such plants. In my experience, I was actually disappointed at how few snakes and spiders I saw, but that's a biologist's view! As a nurse, I was quite glad not to need to treat myself on anyone else I was with. I walked Overland Trail with a Canadian bloke I met in a hostel, and on one of the few times he dared to walk in front, he stopped dead when he saw a large body lying in a sunny patch among trees, turned to me and asked if it was a wild pig and was it going to charge us. I reassured him that it was a wombat, a species not known for aggression, and we watched it bumble off into undergrowth. One risk you might not consider is that a frightened goanna lizard would scratch you badly if it mistook your leg for a tree trunk - normal escape behaviour is to climb a tree. Thanks for those kind words...thats given us something to concentrate our minds on. Unlike you I shall not be in the least disappointed if I dont see a snake at all !! April it's starting to cool off a bit so the snakes in some areas are probably not going to be as active as the middle of summer, they are normally scared off by your footsteps anyway and you should be Fine if you don't go poking them with sticks, it really annoys them. Be careful lifting rocks and logs, that's where you'll normally find spiders when geocaching. What I'd be more worried about if you had into rainforest areas is leaches, carry a packet of matches with you and if you are bitten watch the site, it's not unusual for it to become infected especially if it's just dropped off an old roo or a mangey wombat. speaking of wombats, I just noticed the post above and the grumpy old sods will go you if they take a disliking to you, they're not as cuddly as most think. Most important thing is just to have fun and don't stress. Doesn't sound like you're heading north so you don't need to worry about crocs at all. Have been walking around this country for 56 years now and have only ever seen snakes trying to avoid me. Or once cuddling up under the foot of my swag in winter to keep warm. You get into a technique with looking and lifting ie look from a distance first, if you lift reach over and lift so anything under will automatically escape away from you. Other than the bities, it is very safe in australia with humans having no natural predators ie bears and large cats. The crocodiles can be an issue heed all warnings and every other animal will have the exception, I have been bitten by a Koala, chased by a wombat, kicked by a kangaroo. One of the funniest things I saw was a lizard running up a ladie and digging its claws into her head. She was 5ft 5 the lizard was 3 ft long. Shake your clothes, put your socks in your shoes to fill them so nothing else can get in. I once had a native mouse take up residence in my walking boot one night, I got a shock he got squashed when I put my size 10's in. Emus are curious but will also cause trouble when they have chicks. Cassowarys are notorious attackers but are found mainly in the Nth Qld rain forest. If they attack they will try and jump and rip you open with a spike on their feet. I have been more frightened when chased by a wild bull in a paddock. Thanks for your help and I like your description....'the bities'....very apt. Thats a really good tip about lifting rocks/logs away from you to let the critters escape,its been logged in my to do book! Thanks for your reply...Wombats have now been added to our list of 'watch out for this one'!! I have lived in western Sydney for 62 years, in an area that was once bushland, where we had a farm. Snakes were about, but you rarely saw them. I have been caching since mid '08, and have only ever seen one snake while caching, and that was a small snake under a rock I turned over, I just left it alone and replaced the rock. The chances of you coming across a snake is very low while caching here in Australia. Carry a broad compression bandage and learn how to use it just in case, wear gaiters if you are worried, as most snakes will strike low at your legs. Use gloves when poking about under rocks etc, just in case there might be a spider etc, in there. I hope you enjoy your stay down here, happy caching. As has been said, in reality, most snakes are more scared of you than you are of them. Make some noise, walk noisily through grass and scrub, tread heavily, they usually get out of your way. Be wary of large male kangaroos. I am talking about the ones that are over 5ft tall. If one stands its ground as you approach, standing up on his back legs and tail, back away slowly, keep looking at him, don't run. If a large male roo does happen to approach, put your arms up, and protect your face. They will try to grab you with their arms, then lift their rear legs while balancing on their tail, and attempt to rip your guts open with their hind legs. A guy at work was recently put into hospital by a large male roo. Fortunately, its a rarity. Spiders are usually not too much of an issue, as long as you use common sense. Don't go diving your hands into dark holes. Be careful checking along the edges of structures. Having said that, there are some very dangerous ones out there. Red back spiders and funnel webs are probably the most dangerous. But anti venines are readily available. You can see why they are called Red Backs. Easily identifiable. Anything from a few mm and larger. Great advice above. By April the chance of seeing snakes will be low between Canberra and Melbourne. I tend to walk with a stick and bang it on the ground. The vibrations scare them away. The stick is also useful to poke into holes to make sure it isn't home for an animal. Gloves are sensible, as is the compression bandage for a snake bite. Regarding the red backs, they have distinctive fluffy white eggs the size of a pea. If you see eggs the parents won't be far away. You can buy ice packs that are dry until you activate them which is the way to treat red back bites. Kangaroos are plentiful in Canberra, they are dumb and usually hop away if you approach and wombats are nocturnal. Wearing long pants in the bush areas is recommended and covering ankles with socks or gators also helps with ticks. I know it sounds like everything wants to eat you, it's quite fine, you may find more pretend plastic animal containers (snakes/spiders/lizards/birds) for caches than the real thing. Keep that stick handy. Also, if your heading to Adelaide you should check out what kind of BIG geocaching events might be happening in South Australia at that time. Have a great trip. Thanks to all who have responded to my request. Some invaluable advice which I have taken on board. I can see the Australian news headlines now......'Pommie savaged by wombat as he walked backwards through the bush banging his stick vigourously on the ground'. We have a series of caches along a cycle/walking track. Snakes are regularly seen on this track sunning themselves, usually up to about mid morning, before slithering off into the scrub to do what snakes do. The most common snakes in NSW are the brown snake, potentially aggressive and venomous, and the black snake (usually red bellied), venomous and timid. They grow to about 5-6 feet long. It is unlikely you will come across any in winter. In wet scrub leeches can be a pest. These are pretty harmless, but yucky, they just want your blood. What is scary with leeches is that you mostly don't feel them. Carry a few salt sachets (from fast food joints) and sprinkle salt on them, they'll quickly drop off. Better than matches and safer. If caching in scrub you are most likely to come across ticks (or is it the other way around). If you start feeling unusual symptoms after tick bites get checked for Lyme disease. Medical authorities in Oz seem reluctant to admit it is here but there is to be much evidence to the contrary. Luckily there are very few caches in the sea because waterborne, dangerous critters are another thing altogether and there's no shortage of them. Thanks a lot for that one !!! Agree with the above. As a snake fan, I find snakes hard to come across! Brown snakes and red-bellied black snakes are the most common venomous snakes you may encounter and they are both extremely timid. If you get within 10 metres of one you are lucky (or unlucky depending on your perspective!). Statistically, you are much more likely to die crossing the road, be stung by a bee, scuba diving etc etc...I high proportion of those people bitten are male and drunk. Your more likely enemies are likely to be the blood suckers. I believe these are almost a common as Yowies? Most people are bitten by a snake when----------------------they are trying to kill it. Leave it alone, and it will leave you alone. However, you can never be too careful. Just saw this post on the Oz Mega SA page on Facebook, from a couple of weeks ago. Wishing our Deputy Chair of the organising committee a speedy recovery after being bitten by a brown snake while geocaching. He's now out of ICU and in a ward. Hope he's behaving and back of his feet very soon. Rest up Skippy. Oh, and I forgot to mention, if your coming to Queensland, or the northern Territory, beware The Cane Toad, (Rhinella marina) formerly Bufo marinus. Here is a small educational video, to help you to know what to do if you happen upon him. Not sure if we have a policy here about necroing threads or not but oh well. 1.) If you do happen to disturb a snake, if it flees from you then stay put and let it go, or back away slowly in the opposite direction. If it rears up or watches you then don't run. Back away slowly because if you run it will feel threatened and will strike at you. Also, in Australia, assume that all snakes are dangerous. We do have some harmless ones but the vast majority are venomous and can be deadly. In Tasmania all snakes are venomous so always be careful especially in summer which is when they're most active. If you fo get bitten by a snake, apply first aid and call an ambulance immediately. 2.) As as been said, kangaroos aren't as cuddly as they look. Keep your distance from them, especially during summer. Kangaroos breed all year around but most mating happens during the early summer. 3.) Wombats. They're not really known for their aggression but they can run surprisingly fast and they can bite or knock you over! So keep your distance from them too. And if you happen upon one that's sharing a hole with a cache, never put your hand in with it because they have a cartilage plate in their back that they can press against the side of the burrow with enough force to crush dingo skulls. 4.) Dingos. You'll see them mostly in the northern parts of Australia but they do occur down the coasts too. They aren't tame dogs so keep your distance and don't make eye contact. If they do attack, react in the same way as you would for a dog and protect your vital organs by crouching into a ball. Most attacks will be more bark than bite so you just have to wait it out and call for help if there's anyone nearby. 5.) Crocs. They are surprisingly fast. Obey all signs warning about them and don't go near any murky water or any water where you can see drag marks near the bank. If you get bitten by one then hit it across the snout as hard as you can repeatedly. This usually makes them let go. 6.) Cassowaries. You'll only see these in North Queensland. You can't outrun them and they are notoriously angry and vicious. If you see one, DO NOT look it in the eye! Back away slowly and put a tree or a backpack or something sturdy like that between you and the cassowary and wait for it to go its own way. 7.) Emus. These guys can kick and are fiercely protective of their chicks. Keep well away if you see them. 8.) Jellyfish. You often see these washed up on the beach in coastal areas. NEVER touch them on the beach as jellyfish here can be lethal in as little as two minutes! There are a huge range of types of jellyfish and it's safest to avoid them all. You sometimes see them in estuaries and river mouths too and several species do go upstream several hundred metres to breed. Heed all warning signs in coastal areas and don't go in the water if they've been sighted. If you do get stung call an ambulance straight away. 9.) Ticks. Many parts of Australia are prone to ticks. They're generally harmless to humans unless you have an allergy so if you see one attached to you the best thing to do is let it finish its feed because it will drop off by itself. If you see a tick attached to you and you want to remove it DON'T pull it off because that could leave mouthparts in your skin that can get infected. Pull it off by grabbing as close to the skin as possible with tweezers or with a special tick removal tool and pull gently, and then wipe the area with antiseptic or an alcohol-based disinfectant. 10.) Blue-ringed octopus. These guys have enough venom to kill 26 adult humans in minutes. You can find them in rock pools around much of Australia's coastline. DO NOT touch them and if you get bitten then call an ambulance immediately. They're easily identified because bright blue rings will appear on them when they're disturbed. 11.) In parts of central Australia you will see wild horses and camels. Again, keep your distance and you'll be perfectly safe. Same with wild boars although they have a much wider distribution. 12.) As has been said, we do have some deadly spiders but we also have a lot of harmless ones. Be sensible and use gloves when reaching under/around/behind things and keep your eyes open. Try to learn to recognise some of the deadly ones like funnelwebs, redbacks and black widows and if you get bitten by one of those three then call an ambulance. If you get bitten by another spider and you're not sure what type it is, try to catch/kill it so it can be identified and get medical assistance as soon as possible. With all that said though, Australia is really just as safe a country as any other place on Earth. You could make a list just like this for any other country really, so please don't be afraid to come down here and visit us! And if you're ever stuck or unsure, locals down here are almost always friendly and happy to offer advice or directions, especially in the country! This is very bad advice. Tweezers should never be used to remove a tick. The current teaching in Australia is to freeze the tick using ether spray and when it's dead, just brush it off. If ether spray isn't available a tick key or similar tool should be used but not tweezers. Since this thread was started years ago, I had the pleasure of spending a holiday in Australia a month ago. My daughter is spending a semester at a University near Brisbane, and for her spring break we took a roadtrip down to Sydney and back, selecting geocaches to give us at least one great adventure on each day. I appreciated and followed the advice in this thread - especially about wearing long pants and carrying a hiking stick. I even looked cool to my daughter's Aussie friends because I knew about drop bears from reading this thread. It wasn't until the end of the trip that I ran into any wildlife issues. I know it sounds like everything wants to eat you, it's quite fine, you may find more pretend plastic animal containers (snakes/spiders/lizards/birds) for caches than the real thing. This statement played out for me quite vividly. My last full day of hiking and caching took me to the Dunethin Rock area near the Sunshine Coast. There was a great series of caches that featured artificial "cache guardians," like fake bugs and lizards. This lulled me into thinking that the enormous Huntsman spider I encountered after opening a letterbox's outside container was "just another decoration" in a themed series. Then it moved! And then it hitched a ride with me back to the car, unbeknownst to me. Read the full story here. I've come across the occasional huntsman in caches. 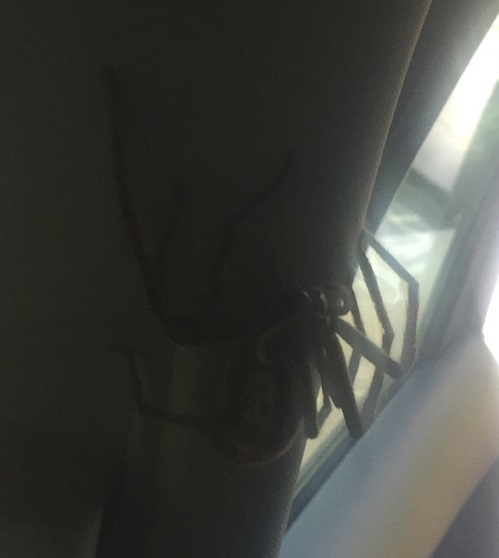 The one in the car may not have been the same because these spiders have a knack of finding their way into cars, often hiding under the sun visor. For a while last year I had a redback spider take up residence under the fuel filler lid of my van where it had deposited its silk egg sack. I kinda like huntsman spiders in the house as they feast on flies amd mozzies and generally stay up high near the ceiling. I see this is an old thread, but the information is always useful. One dangerous Aussie creature not mentioned here is the Magpie. That ubiquitous black and white bird that carols so beautifully in the mornings. In springtime some nesting magpies become very aggressive and will swoop anyone who ventures into their territory. They can draw blood (I have had this happen, I had headphones in and was not aware of the bird until I felt a sharp pain on my head where it's beak had connected) and a few unfortunate people have lost eyes. If you are caching anywhere with tall trees in the springtime Magpies may be a threat. - Keep an eye and ear out. Maggies will usually give a familiar "dive bomb" call as they swoop. It's hard to describe this call, but pretty much anyone in Australia would be able to recognise it. - If a magpie is swooping wave your hands in the air as it goes over. This will deter the immediate attack but some birds are persistent and will continue to swoop until you leave. - Wear sunglasses to protect your eyes. - A helmet or any kind of head protection is not a terrible idea. - The best course of action if you find yourself in the territory of a cranky magpie is to leave the area and try again in a few weeks time once breeding season is over and the birds settle down. Yep! I will agree with the previous post. I have been caching for 12 years and the only wildlife that have attacked me have been birds. Magpies, Plovers and Butcher Birds have taken a liking to my head. I find that wearing a broad brimmed hat is a good defence. It is also good for keeping the sun off.. I also carry a hiking pole which is good for waving over the head if you are attacked.